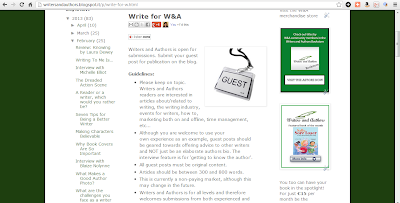 I often complain that people submitting guest posts for my blogs don't follow the guidelines. I swear about 80% of writers submitting guest posts and interviews don't follow the guidelines. This is a huge amount and really makes me worry about the state of the writing industry on the whole as well as for the careers of these individual writers. As writers we're constantly faced with guidelines to follow. It's widely known that writers who submit manuscripts that don't follow the publisher/agents guidelines will get added to the reject pile without the editor getting past the first page. So why do writers choose to ignore guidelines for blogs? Blogs are mainstream now and one of the best mediums for spreading the word about your latest release and drumming up some interest in your book. Guest blogging gives you great back-links to your website and sales pages too which makes a huge difference to search results for your website. So why do writers not follow the guidelines? It's really not that hard people! The weird thing is that by not following the guidelines writers often create more work for themselves as well as getting added to the hosts "list of people that can't follow guidelines" (Yep I have one and I know many others do too). I also have a list for people that stand out as being good guests. They supply good content, FOLLOW THE GUIDELINES, and do a great job of promoting their post. These people are the ones I will make space for when they are touring a book and need stops. My Writers and Authors blog is high traffic and spaces are in high demand (I have to turn large numbers of people away as I simply don't have any free days left for posting and I book up at least 2 months in advance if not more). This makes it even more annoying when I get a guest post that doesn't follow the guidelines. I turned others away to give them the space and they didn't even follow some simply guidelines. I can't help but think that maybe I should have given the space to one of the others? My biggest pet peeve at the moment is people who indent. It takes me ages to edit the piece for publishing when they do as I have to reformat the whole lot of it before I can post to the site. Another is people who don't include images to go with their post. This one really mystifies me as surely one of the main points in doing a guest post is to promote their book. Number 3 are those that turn the whole post into a sales pitch. A guest post is where you share your knowledge and experience. Using examples of your own work is fine but you need to keep the focus on the audience. You're writing for the reader of the blog NOT an advertising space. The post is where you build your author brand and build a reputation for being an expert in your field. The promotional part takes part in the byline. I'm definitely thinking of cracking down of those who don't follow my guidelines. Time for this blogger to get tough!